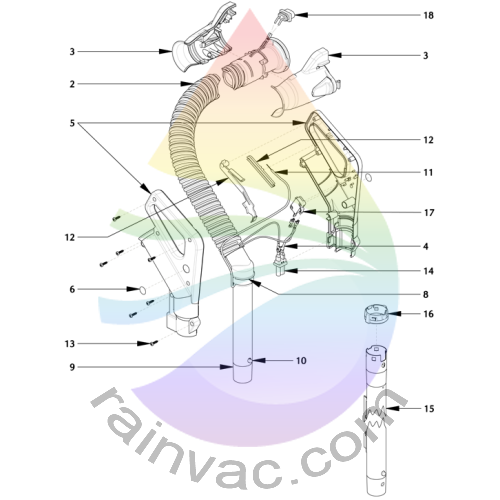 The Rainbow PN-2E electric hose assembly has went through FOUR different versions since it first came out in 1998. Please view all versions below to confirm which version you have. Effective serial number 7000000 with a start date of August 5th 1998 through current production. This schematic covers the complete Rainbow PN-2E power nozzle electric hose assembly that allows for water pickup. This version was standard during the late Gold version and of course includes all Silver units. All previous electric hoses are not rated to pickup water. Effective serial number 7916820 with a start date of June 7th 2007 through current production. This schematic covers the Rainbow complete PN-2E power nozzle electric hose assembly that was introduced with the Gold version Rainbow. This version was the start of the new ergonomic design but was not rated for water pickup. Effective serial number 7690873 with a start date of August 3rd 2004 through serial number 7916819 and an end date of June 6th 2007. This schematic covers the complete Rainbow PN-2E power nozzle electric hose assembly that included the snap design hose coupling kit. This design allows for less stress at the soft hose area where the hose connects to the Rainbow. Helps to prevent tears and holes in the hose from pulling behind you. Effective serial number 7651458 with a start date of April 13th 2004 through serial number 7690872 and an end date of August 2nd 2004. This schematic covers the complete Rainbow PN-2E power nozzle original version electric hose assembly that includes the handle kit, button lock, and switch actuator. This version has had several improvements to help with durability and function. Effective serial number 7303305 with a start date of November 17th 2000 through serial number 7651457 and an end date of April 12th 2004. The date below is different to show that a metal spring was used on the switch actuator instead of the plastic spring arm used for current replacement.